Fall is simply my favorite season. Winter is a close second though. That being said, I always look forward to the special limited edition seasonal candies that debut and/or return this time of year. I just love the Fall themed M&M’s. So much more fun to eat than regular ones. Needless to say when I went grocery shopping last, I stocked up (with several packs). Yesterday was a crazy day that also included an impromtu visit from friends. I ended up making this delicious cheeseball to serve before dinner. While I was wrapped up in visiting, I didn’t get an immediate picture. FYI, the color on M&M’s runs when you let them sit for a few. Don’t let the looks fool you though. This was delicious. The perfect appetizer to serve for friends visiting in Fall. The perfect treat for any Fall occasion or event. Even an impromptu dessert. Did I forget to mention how much I love the Fall themed M&M’s?! In a mixing bowl, combine cream cheese, yogurt, apple, caramel, brown sugar, and vanilla until evenly mixed. Using your hands (remember to wash first! ), form the mixture into a nice round ball. Wrap the cheese ball in saran wrap and refrigerate for at least 30 minutes. 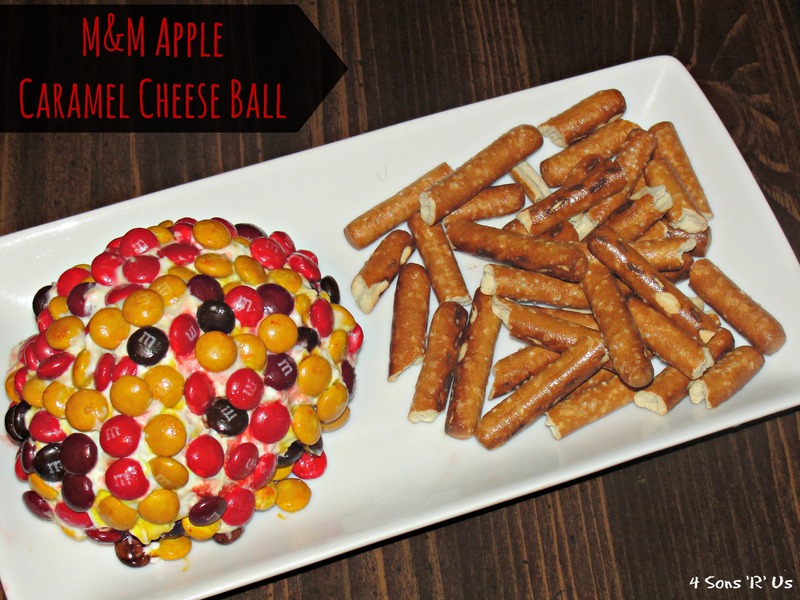 Remember, the colors on the M&M’s will bleed so don’t roll your cheeseball in the candy until just before serving. If ready to serve roll the ball around in M&M’s until completely covered. Serve with pretzels, apple slices, or non-salted cracker crisps.